Like an inescapable vortex, I was into drawn into the world of eels after struggling to identify some freshly collected morays from Australian inshore reefs. I thought it can’t be this difficult but the more I looked the more diversity I found – a whole new kettle of fish! Fast-forward 15 years and my knowledge has grown, but uncovering their secrets remains an ongoing challenge. Eels (order Anguilliformes) are a primitive group of 16 diverse families that inhabit cool temperate to tropical zones of all oceans. They have infiltrated freshwater and nearshore marine environments, oceanic midwaters and deep abyssal seas. Although their gang grows towards 1000 members, many remain nameless, awaiting notoriety; others masquerade under the names of their close siblings due to puzzlingly similar features. But all share a common bond: a transparent leaf-like ‘leptocephalus’ larval stage (see image). Although appearing to drift aimlessly at the mercy of ocean currents, leptocephali are active swimmers, adeptly plucking plankton until a suitable settlement is secured. Exactly how these ocean wanderers locate prospective homes near the seafloor is a mystery. Recent studies suggest the oceanic larvae of freshwater eels use their ‘magnetic compass’ to navigate in the direction of currents that transport them to their ‘ancestral’ home. Eels process the world around them by employing a complex system of sensory canals in their head and lateral line that act as an information super-highway. 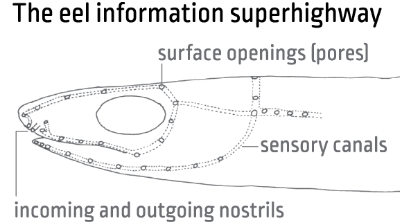 This network of canals has surface openings (pores) and incoming and outgoing nostrils that are useful in species identification. Tooth size, shape and number are often characteristic of different groups and reflect dietary preferences and possible feeding strategies. Fangs and needles seize and pierce; canines and molars tear and crush; flexible jaws and elastic throats gulp and swallow – these are the predatory tools of the eels. Although the shallows are dominated by sand-eels, morays, congers and others, the deep-sea is dominated by the basketwork or cut-throat eels (Synaphobranchidae) that can flourish in frigid waters to more than 5000 metres. Their common name stems not from a fondness of handicrafts or violence, but for ornately patterned scales and slit-like gill openings. Basketwork eels segregate by depth and feeding method, and a single species usually dominates a depth zone or habitat. The largest have flexible jaws for swallowing whole prey such as fishes and squids, captured live or opportunistically scavenged. Others have long rigid jaws with numerous small teeth, probably for dining on small benthic invertebrates. On this voyage, we have so far encountered two species of basketwork eels and larvae of three unidentified species. 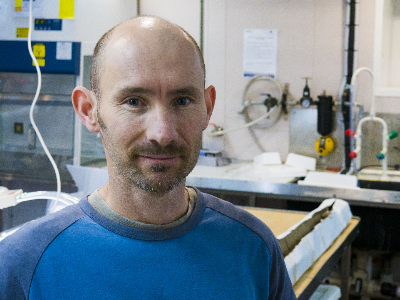 The most commonly collected has been the Southern Cut-throat Eel, Histiobranchus australis, a Southern Hemisphere species occurring in depths of 1000-3000 m. Multiple geographic variations are known, so depositing these specimens into scientific collections will help towards resolving the taxonomy. I patiently await the next eel enigma! A fascinating insight into a range of eels I hadn't heard of before. Your research is particularly interesting to plebs like me who thought eels were best stalked out of fresh water and smoked or grilled before eating. Eels, eels, eels maybe its the inescapable vortex. Parramatta will be impressed to know they might be part of it. Nevertheless its fascinating stuff John. Great to see you're pushing back the frontiers of science with regard to this particular group of deep sea fishes. Keep up the good work. I love to see and learn more about eels, Here in Rhode Island, USA I have been collecting migration data on american eels for several years, right now they are my favorite species of fish, There is so much to learn about this fish it will take a life time and more to learn. BTW, I use to love to eat eel, now I feel they are a kindred spirit and never think of them as food. (at least for me) I have spent many hours of my life explaining to people that eels are not snakes and they offer many lessons to humans if we are willing to listen, one being tenacity.